According to a report by the Mortgage Bankers’ Association the delinquency rate for mortgage loans on 1-4 unit residential properties decreased to a seasonally adjusted rate of 5.30% of all loans outstanding at the end of the second quarter of 2015, 24 basis points less than its level in the first quarter of 2015 and 74 basis points below its level one year ago. The 4-quarter decline in the share of mortgages past due, measured on a not seasonally adjusted basis, reflected a decline across each stage of delinquency. On a not seasonally adjusted basis, the percentage of all loans past due fell by 70 basis points, loans 30-59 days past due fell by 17 basis points, loans 60-89 days past due fell by 8 basis points, and loans 90 or more days past due decreased by 45 basis points. However, the foreclosure starts rate remained unchanged over the past four quarters. 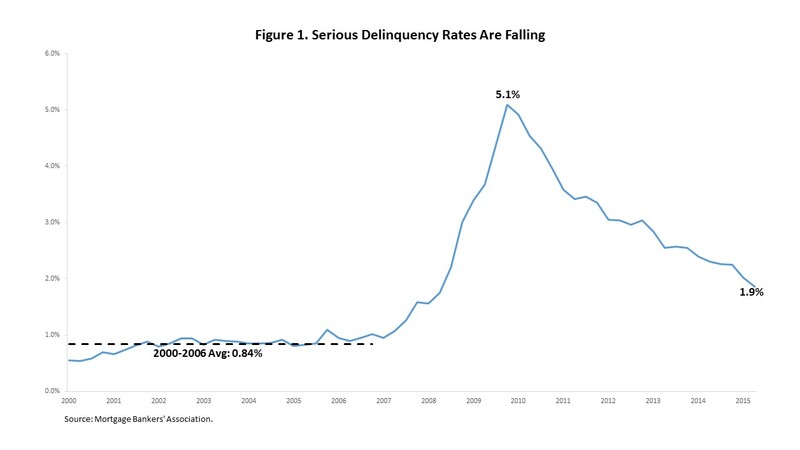 As Figure 1 below indicates, the serious delinquency rate is now 3.2 percentage points below its peak level in the fourth quarter of 2009. An earlier post demonstrated that the serious delinquency rate, the percentage of mortgages 90 or more days past due closely tracks the foreclosure starts rate. As of the second quarter of 2015, the serious delinquency rate stands at 1.9%. However, the current serious delinquency rate is still higher than its average rate recorded in the years leading up to the crisis. Although the serious delinquency rate on mortgages remains elevated relative to its 2000 to 2006 average, estimates from the Federal Reserve Bank of New York (FRB NY) indicate that it is below comparable rates on other household debt products. The mortgage serious delinquency rate calculated by the MBA is restricted to first-lien mortgages, while the rate calculated by the FRB NY also includes home equity loans. 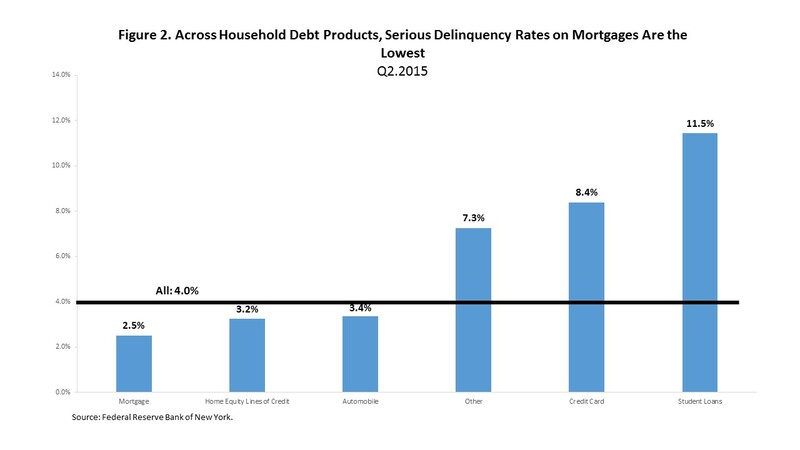 According to the FRB NY, the serious delinquency rate on mortgages was 2.5% in the second quarter of 2015, 0.7 percentage points lower than the rate on home equity lines of credit, the household debt product with the next lowest serious delinquency rate, and 1.5% points below the average rate across all household debt.